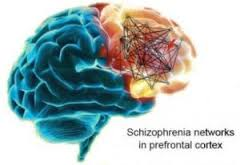 Schizophrenia, Bipolar Disorder Share the Most Common Genetic Variation Press Release • August 12, 2013 The largest genome-wide study of its kind has determined how much five major mental illnesses are traceable to the same common inherited genetic variations. Researchers funded in part by the National Institutes of Health found that the overlap was highest between schizophrenia and bipolar disorder; moderate for bipolar disorder and depression and for ADHD and depression; and low between schizophrenia and autism. Overall, common genetic variation accounted for 17-28 percent of risk for the illnesses. “Since our study only looked at common gene variants, the total genetic overlap between the disorders is likely higher,” explained Naomi Wray, Ph.D., University of Queensland, Brisbane, Australia, who co-led the multi-site study by the Cross Disorders Group of the Psychiatric Genomics Consortium (PGC), which is supported by the NIH’s National Institute of Mental Health (NIMH). “Shared variants with smaller effects, rare variants, mutations, duplications, deletions, and gene-environment interactions also contribute to these illnesses.” Dr. Wray, Kenneth Kendler, M.D., of Virginia Commonwealth University, Richmond, Jordan Smoller, M.D., of Massachusetts General Hospital, Boston, and other members of the PGC group report on their findings August 11, 2013, in the journal Nature Genetics. “Such evidence quantifying shared genetic risk factors among traditional psychiatric diagnoses will help us move toward classification that will be more faithful to nature,” said Bruce Cuthbert, Ph.D., director of the NIMH Division of Adult Translational Research and Treatment Development and coordinator of the Institute’s Research Domain Criteria (RDoC) project, which is developing a mental disorders classification system for research based more on underlying causes. Earlier this year, PGC researchers – more than 300 scientists at 80 research centers in 20 countries – reported the first evidence of overlap between all five disorders. People with the disorders were more likely to have suspect variation at the same four chromosomal sites. But the extent of the overlap remained unclear. In the new study, they used the same genome-wide information and the largest data sets currently available to estimate the risk for the illnesses attributable to any of hundreds of thousands of sites of common variability in the genetic code across chromosomes. They looked for similarities in such genetic variation among several thousand people with each illness and compared them to controls – calculating the extent to which pairs of disorders are linked to the same genetic variants. 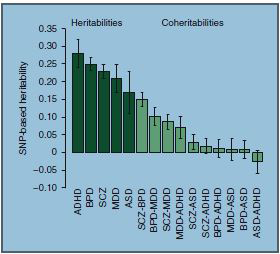 The overlap in heritability attributable to common genetic variation was about 15 percent between schizophrenia and bipolar disorder, about 10 percent between bipolar disorder and depression, about 9 percent between schizophrenia and depression, and about 3 percent between schizophrenia and autism. The newfound molecular genetic evidence linking schizophrenia and depression, if replicated, could have important implications for diagnostics and research, say the researchers. They expected to see more overlap between ADHD and autism, but the modest schizophrenia-autism connection is consistent with other emerging evidence. The study results also attach numbers to molecular evidence documenting the importance of heritability traceable to common genetic variation in causing these five major mental illnesses. Yet this still leaves much of the likely inherited genetic contribution to the disorders unexplained – not to mention non-inherited genetic factors. For example, common genetic variation accounted for 23 percent of schizophrenia, but evidence from twin and family studies estimate its total heritability at 81 percent. Similarly, the gaps are 25 percent vs. 75 percent for bipolar disorder, 28 percent vs. 75 percent for ADHD, 14 percent vs. 80 percent for autism, and 21 percent vs. 37 percent for depression. Among other types of genetic inheritance known to affect risk and not detected in this study are contributions from rare variants not associated with common sites of genetic variation. However, the researchers say that their results show clearly that more illness-linked common variants with small effects will be discovered with the greater statistical power that comes with larger sample sizes. “It is encouraging that the estimates of genetic contributions to mental disorders trace those from more traditional family and twin studies. The study points to a future of active gene discovery for mental disorders” said Thomas Lehner, Ph.D., chief of the NIMH Genomics Research Branch, which funds the project.